It is still a matter of debate among policymakers and scientists whether biofuels have a place in the list of future clean energy portfolios although they are being studied as an energy source over many years. This dispute has led to the exploitation of other clean technologies like solar and wind which has overtaken the use of biofuels in actual practice. Biofuel developments are still not underway, because of their inherent drawbacks in terms of acceptance and feasibility. 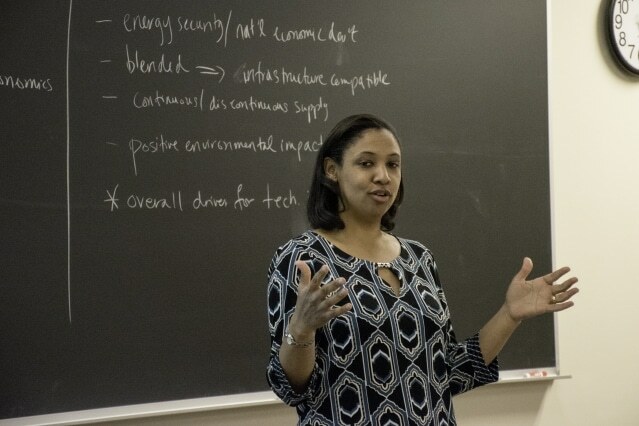 MIT professor of chemical engineering and a biofuels expert, Kristala Prather has her own dimension about the concept of biofuels renaissance. She had an open discussion with a group of undergraduates at the MIT Energy Initiative (MITEI) on April 25 regarding the future of biofuels, the obstacles they face, and how to overcome these issues. Prather asked the students to list the advantages and disadvantages of using biofuels at the beginning of her talk, which was a division of MITEI’s new Undergraduate Energy Seminar Series. Students listed that national economic development, beneficial environmental impacts, energy security, and continuous energy supply as advantages. As disadvantages, the students listed queries about cost, sustainability, and the ubiquitous food vs. fuel debate - the concept that the biomaterial could be used as food rather than fuel. Prather started her discussion on the basis of these points for a detailed outlook of the energy legislation in the U.S. that has started to lay the foundation for biofuels over the last 10 years. There are numerous reasons for considering the use of biofuels, she said, the majority of them enlisted by the students as advantages. The environmental aspect of biofuels drew her interest towards this subject. Positive environmental impacts were a big driver for me. When I first got into this field, I had this vision of engineering microorganisms to create new kinds of biofuels. She wished to assist energy producers in moving their focus from fossil fuels and also widening the range of biofuels beyond starch-based ethanol. What motivated her, was “innovation in an intellectual context, and then moving from there to looking at things that can have a positive impact” she said. One among the students in the audience interrupted at this point: “There’s also the idea that going from zero to 1,” he said, “is always harder than going from 1 to n.” Or, developing something from absolutely nothing is much more complicated than improvising on something that has already been created. “Brilliant point.” Prather looked to see who had commented and on spotting him, smiled. “I know you. You took my class.” The student nodded. While answering, Prather drew a technology development curve of achievement vs. time on the blackboard. She explained that students who were keen on technology research would require knowledge about this graph, especially if they aimed at grad school. That was part of the driver I had for naming the talk what I did. Is it too late or is it just too early for biofuels? I think it’s too early — we just haven’t spent enough time on the problem yet. The Undergraduate Energy Seminar Series was formed by the MIT Energy Initiative to provide workshops and lectures to students who were keen on pursuing energy studies. It provides an insight in energy studies classes, careers and research. The discussion with Prather was the last seminar of the academic year 2015-16.